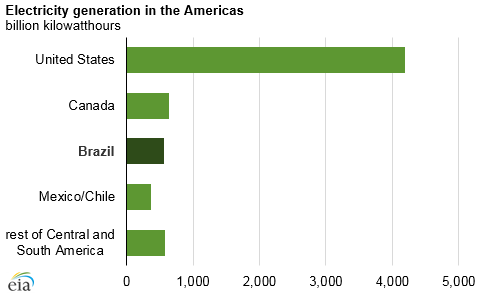 Brazil generates the third-highest amount of electricity in the Americas, behind only the United States and Canada. In 2016, Brazil had an installed generating capacity of 137 gigawatts (GW) and generated 560 billion kilowatt hours of electricity. Most of Brazil’s generation capacity is located in the Amazon basin, north of most urban load centers, which are located in the southeast, contributing to the complexity of Brazil’s transmission and distribution system. 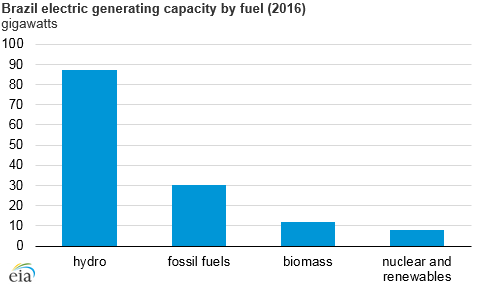 Hydroelectricity makes up the bulk of Brazil’s generating capacity (87 GW), with the remainder provided by fossil fuel sources (30 GW), biomass (12 GW), and small amounts of wind and nuclear. Brazil is the second-largest producer of hydroelectric power in the world, behind only China, and hydropower currently accounts for more than 70% of electricity generation in the country. Fossil fuels are Brazil’s second largest source of electricity. Natural gas is the primary fossil fuel used in Brazil and makes up more than half of Brazil’s fossil fuel capacity. Coal makes up much of the rest. The planned Porto de Sergipe combined-cycle natural gas power plant, scheduled to come online in late 2019 with a generating capacity of 1.5 GW, will be the largest natural gas power plant in Latin America. Brazil has two nuclear power plants, the 640 megawatt (MW) Angra 1 and the 1,350 MW Angra 2. Eletronuclear, a subsidiary of state-owned Eletrobras, operates both plants. The Angra 1 nuclear power plant began commercial operations in December 1984, and Angra 2 began commercial operations in December 2000. Construction of a third plant, the 1,405 MW Admiral Alvaro Alberto Nuclear Power Station (CNAA), began in 1984 but has not yet been completed. Eletronuclear anticipates that it will begin commercial operations by May 2018. Brazil plans to increase the share of non-hydro renewables in its generation mix and in December 2015, announced the Distributed Generation Development Program for Energy (ProGD) to expand consumer investment in renewable resources, particularly solar photovoltaic. The ProGD projects that 2.7 million consumer units could provide 23.5 GW of electric generation capacity by 2030. The government plays a substantial role in the Brazilian electricity sector—Eletrobrás owns about one-third of total installed capacity. Transmission lines in Brazil are also largely state owned, with Operador Nacional do Sistema Elétrico (ONS) being a nationwide operator. Most of Brazil’s generation capacity is located far from urban demand centers, which requires significant investment in transmission and distribution systems. 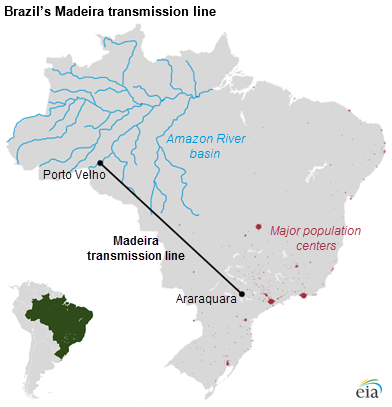 The Madeira transmission line, completed in 2014, is the longest high-voltage, direct-current line in the world and spans 1,476 miles to link new hydropower plants in the Amazon Basin to major load centers in the southeast. Increased emphasis on distributed generation will help reduce the need for additional transmission infrastructure in the future.